Sam Reinhart for Carolina Hurricanes defenseman Noah Hanifin? As mentioned in the previous blog, Buffalo GM Jason Botterill has no ties to any player presently in the system which gives him total freedom to do what he thinks is best for the organization. He has stated that fixing the defense is a top priority and we also know that the Sabres are way too close to the salary cap for a 23rd place team. Botterill has no attachments to players like Evander Kane, Zach Bogosian, Josh Gorges and Robin Lehner, all of whom were acquired via trades by previous GM Tim Murray. He didn't sign Matt Moulson or re-sign Tyler Ennis nor did he draft Sam Reinhart with the second overall selection in the 2014 NHL Draft. Those in the group above represent individual question-marks for the team moving forward for one reason or another whether it be salary, term, inconsistencies, age, use and/or style of play. Word on the street is that winger Evander Kane is on the block and that the Los Angeles Kings are a potential destination. Yesterday's question was, would you, Sabres fans, trade Kane to the Kings for defenseman Jake Muzzin? I am of the opinion that you keep a talented powerforward like Kane unless he's unwilling to sign a reasonable extension in the $6M/2-3 yr. range. Today we look at trading from a position of strength for a position of need. It wasn't all that long ago that we Sabres fans were hearing calls from Buffalo's GM that they had two of the top-20 centers in the league. 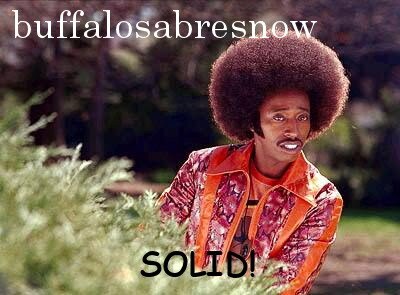 That statement belied the fact that the Sabres were incredibly weak down the middle. 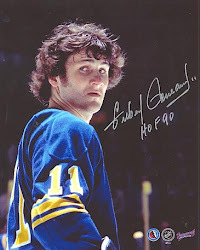 At the time GM Darcy Regier made that statement, the Sabres did, however, have a pretty good crop of defensemen on the roster and in the system. That was totally flipped by Regier's replacement, Tim Murray, as he went about fortifying the center position through a trade for Ryan O'Reilly and the drafting of two centers--Sam Reinhart (2014) and Jack Eichel (2015)--with the second-overall pick in consecutive years. It was assumed that those three would anchor the top-nine but lack of talent and depth pushed Reinhart to the wing and he found himself on the right side of both O'Reilly and Eichel in the top-six. It was also a preferred position for Reinhart in the eyes of former head coach Dan Bylsma. Taking over the third-line center duties was a rather capable Johan Larsson. Bottom-six center depth is there with Larsson, Zemgus Girgensons and the emergence of Evan Rodrigues in his move from wing to center. Also in the pipeline, and probably not too far away, is 2016 second round pick Rasmus Asplund. The Sabres are looking pretty solid down the middle especially when you have players like O'Reilly and Eichel in the top two slots. However, when Murray flipped his depth, the defense became woefully inadequate and Botterill, it would seem, is looking for an immediate influx of talent on the back end. Hence the Kane trade rumors. Despite his issues, Kane has value, moreso now than in any time since he was traded for in 2014. Reinhart also has value. The Vancouver, BC native and son of former NHL'er Paul Reinhart has NHL size (6'1" 193 lbs.,) great hockey sense, and can produce. In 158 games for the Sabres over the last two full seasons, Reinhart has scored 40 goals and added 49 assists. Although his goal production went down year-over-year (23-17) his assists went up (19-32) as he's beginning to live up to his pre-draft profile of being an elite play maker with supreme vision. There isn't an iota of flash to his game and the subtlety with which he plays often goes unnoticed. It would seem as if he's the type of player that will continue to quietly get better and better, albeit at a slower pace than many fans would like. At this point in time Reinhart is more of an enabler than a game-controlling player. Oft times he's being compared to his 2014 draft counterpart Leon Draisaitl who was selected one slot behind him. Draisaitl is coming off of a superior season of 29 goals and 47 assists in 77 games for the Edmonton Oilers. It's something that will hover over him until there's a change in the narrative. Of a more direct concern for the Sabres, however, is how Reinhart fits into the way Botterill wants his team to play. Reinhart is a good NHL skater, but with the way the game is played, it doesn't look like his straight-line skating is enough to keep up. That's ultimately where his hockey smarts comes into play. He seems to add a half-step to his skating as his vision allows him see to what's unfolding in front of him well before it happens. It may be a lengthy learning curve that will pay big dividends when all's said and done with the big question being, is Botterill all-in on Reinhart and his learning curve? If not, using Reinhart as a valuable trade chip to land a top-four defenseman may be in the offing. Much was made of Carolina's Noah Hanifin at the 2015 NHL Draft. He was the very talented third wheel in the Connor McDavid/Jack Eichel saga. Many had Hanifin as the consensus third overall pick behind those to but he dropped to the Hurricanes in the five-slot. Hanifin has the size at 6'3" 206 lbs. and he's an exceptional skater, which is perfect for the way GM's are looking to build their blueline. The Boston, MA native started out well enough in Carolina with 22 points (4+18) his rookie season then increased those totals with five more assists in 2016-17. Hanifin was down the depth chart for the Canes' last season until Ron Hainsey was traded at the deadline and he was given more top-half minutes. The knock on Hanifin is that the just turned 20 yr. old struggled with his defensive responsibilities which took some of the luster off of his potential. He's still and extremely gifted skater who can produce, but those struggles brought about question-marks as to whether or not the lefty will be able to handle top-pairing, or even top-three minutes. Carolina has a very deep and talented defense-corps but needs forward help, especially in the top-six, while the Sabres have forwards but need defensemen. And that's why this could be a good hockey trade for both clubs. Even though they eclipsed their production from their rookie campaigns, both Reinhart, who's 21 yrs. old, and Hanifin had sophomore campaigns that overall, weren't looked upon favorably. But there's still plenty of upside for both players. From this blogger's perspective, a swap like this is pretty easy to do despite the fact that, in regards to Reinhart, there's still plenty of untapped potential that will eventually be realized. Would you trade Sam Reinhart for Noah Hanifin?